Make the perfect gift for your daughter or granddaughter! This listing is for a PDF digital sewing pattern to make a reversible, pull on style jumper for 18 inch dolls. Designed to be worn with a shirt underneath (Like the Jumping Jack turtleneck shirt from Oh Sew Kat! ), it can be worn without to be a cute sundress too! Instructions are included for the cute, "button front" style as well. - Computer Drawn Pattern Pieces; PDF Digital download- print and sew today! This jumper style dress is quick and and simple to sew! Make it fully reversible for two doll dresses in one! Fabric covered elastic straps and a cute side pleat let you express your own doll style. Create the perfect look for back to school, fall, Christmas, Valentine's Day with a shirt and tights, or try a tee shirt under a pretty cotton print. There are no zippers or hook and loop tape to sew, pull it on over the doll's feet for easy dressing. This pattern is also a perfect starter pattern for girls that want to learn to sew for their dolls, or for more experienced seamstresses to make a basic doll wardrobe with lots of options. This simple dress is very easily made from a quarter yard of fabric and 3/8th inch elastic. The solid front is a perfect canvas for your favorite applique, machine embroidery, heat transfer designs, lace, buttons, and other trims. Mix and match for lots of sewing fun. Find the turtleneck shirt pattern here: https://www.etsy.com/listing/572765017. Your instant download file will include full color photos, full sized, computer drawn, pattern pieces and directions. Just print and sew! If you run into trouble, I'm only an email away at ohsewkat [!at] gmail.com. This pattern was specifically designed and tested on 18 inch dolls such as American Girl ®. Oh Sew Kat! is not affiliated with American Girl®; no endorsement is implied. My dolls have a waist measurement average of 10 1/2 inches. Please measure and test the fit on your own doll as there are many on the market and it may not fit the same on all of them. Oh Sew Kat! 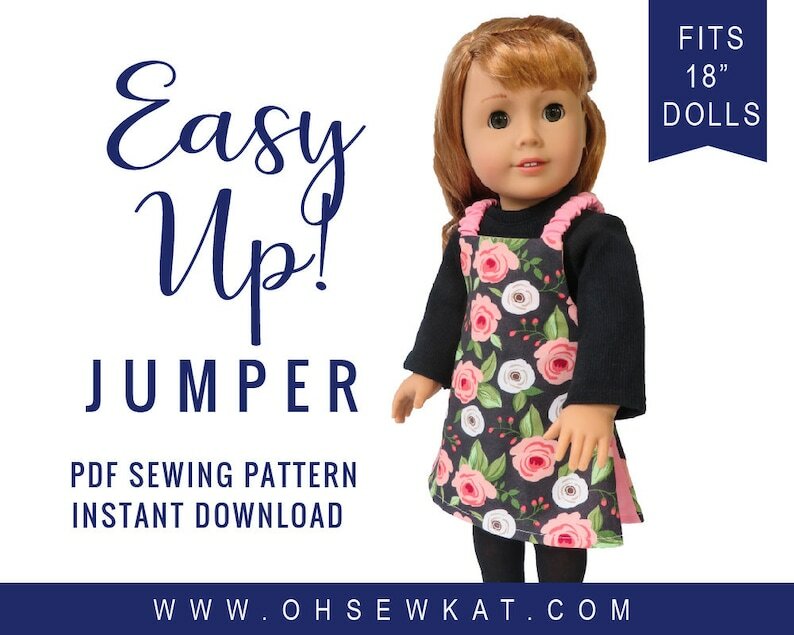 also offers a large selection of digital patterns for other sized dolls such as WellieWishers ™ dolls, Bitty Baby, A Girl for All Time, and Disney Animators' here in my shop. Find more simple patterns for your favorite 18 inch dolls here: https://www.etsy.com/shop/OhSewKat?section_id=16912113. See the entire Oh Sew Kat pattern library here: https://www.etsy.com/shop/OhSewKat. This outfit is adorable. Pictures definitely helped me. Clear and adaptable pattern. Thank you. I love your patterns. Can’t wait to sew this one up. This is a wonderful, easy and very cute pattern! There are variations, as usual, that Kat includes in her designs. It's straight forward and there's no hard seams. LOTS of straight lines. It's super cute and uses very little fabric. The pattern is very detailed, as usual, with step-by-step instructions for everything!!! Kat, I am your biggest fan!!! Your work is awesome and I never fear when buying one of your patterns!!! I know you've covered all the bases!!! THANK YOU!!! !